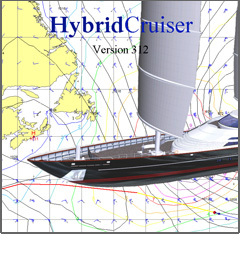 Unique in route planning software, HybridCruiser is intended for use in projecting voyage costs for vessels that can make voyages under sail or power or a combination. Voyage costs are understood to be the cost of fuel, crewing costs and other running costs or simply daily charter hire. Sail is understood to be vessels that can sail to ‘windward’. The software assumes that engine power can be used when the wind is not ‘route compatible’. This allows the user to input sailing criteria that enables the software to calculate the optimum route from a series of alternatives. It will also suggest the use of engine or sail power for each ocean gridpoint for any month of the year for any ocean route. The software holds databases of average wind and wave conditions for each month, ocean currents as well as ports and positions. The user inputs voyage parameters such as critical wind angles and maximum deviation angles in addition to other information about the particular vessel. A full User Guide is embedded in the software. One of the main purposes of the software is to assess the economic impact of using ‘hybrid’ ships. HybridCruiser can also be used in real time on board ship. Marincom offers a subscription weather forecast service for this purpose that can be updated twice daily allowing the route to be constantly refined.